Ofgem said customers were misled during sales approaches due to Scottish Power's failure to "adequately train and monitor" staff. Consumers on the "warm home discount" will receive about £50 each. Money will also go to those who were misled. The company has apologised for the errors between 2009 and 2012. "Today's announcement is a clear signal to energy suppliers of the consequences of breaching licence obligations," said Ofgem's senior partner in charge of enforcement Sarah Harrison. Scottish Power will pay £7.5m to the 140,000 customers it has on the government-led "warm home discount scheme" aimed at supporting customers who are likely to be at risk of fuel poverty. It estimates each will receive a payment of about £50. It has also set up a £1m customer compensation fund for customers who believe they have been mis-sold to. 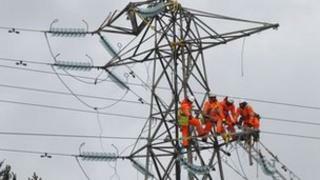 Scottish Power said the failings identified had now all been rectified. It stopped doorstep sales in 2011 and has also put in place independent checks on the conduct of its telephone agents. Ofgem said the size of the fine reflected Scottish Power's cooperation during the investigation. "Ofgem's investigation found no evidence of a strategy by Scottish Power to deliberately mis-sell to customers," the energy regulator said in a statement. Scottish Power said it would write to the 336,000 people who could have been affected and could be in line for compensation. "We accept Ofgem's findings and we apologize unreservedly to those customers affected," said Neil Clitheroe, of Scottish Power. Scottish Power is not the only energy supplier to have been in trouble with the regulator over doorstep selling. In April, Ofgem said that SSE was guilty of management failures that led to "prolonged and extensive" mis-selling through telephone, in-store and doorstep sales. The regulator handed down a record £10.5m fine. Two other investigations - into Npower and E.On, are ongoing. Energy companies no longer sell energy door-to-door, a change that has reduced the number of people switching suppliers in recent times, figures show. Also on Tuesday, new rules from Ofgem came into force preventing energy firms from increasing prices during fixed-term contracts. Firms are also banned from automatically rolling customers on to another fixed-term offer when their current one ends. Ofgem says the changes are aimed at ensuring customers get the best energy deal for them. "Ofgem is going to make it easier for consumers to 'vote with their feet'", said Ofgem chief executive Andrew Wright. The rules are part of a series of reforms, relating to new standards of conduct for energy firms. "Our reforms seek to give consumers the tools they need to find the best energy deal for them," added Mr Wright. The reform follows Ofgem's research showing that even on fixed-term deals, suppliers could still increase prices.